Motor coordination and development is heavily influenced by children’s access to play. Fine motor skills involve the coordination of small muscle movements that enable children to complete tasks like manipulating objects, tying shoes, zipping jackets, and writing (http://www.pbs.org/parents/child-development/sensory-play/developing-and-cultivating-skills-through-sensory-play/). Conventional toys such as pegboards, puzzles, blocks, play dough, beads, paintbrushes, and markers all support small muscle development and motor memory. There are also countless ways to take everyday items and turn them into fine motor play activities (http://theimaginationtree.com). For example, children can dig items out of sand/play dough/rice, manipulate pipe cleaners to create art projects, finger paint, construct jewelry from pasta/beads, and explore sensory trays to draw shapes/letters (http://theimaginationtree.com/). In addition to the development of fine motor skills, play also facilitates gross motor skills. Gross motor skills refer to the large muscles of the body, which are necessary for activities such as walking, running, pushing, pulling, and throwing (http://www.pbs.org/parents/child-development/sensory-play/developing-and-cultivating-skills-through-sensory-play.). There are countless naturally occurring play activities that develop large muscles. Some examples include dancing, tumbling, playing catch, climbing, jumping rope, gymnastics, and soccer (http://familyfitness.about.com/od/preschoolers/a/grossmotorskill.htm). If you have a playroom, building obstacle courses, climbing walls, balance beams, and swings are ways to make your home a mecca of gross motor development for hours of fun. 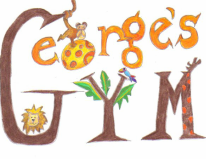 George’s Gym’s curriculum is designed to allow gross and fine motor skills to flourish. This includes activities that involve holding markers, applying stickers, throwing balls, and tumbling. Our goal is to create that mind/body connection, and strengthen both through play. By providing opportunities to engage in physical activity, we hope to provide the necessary foundation to ease the journey through childhood.